Defined by versatility and a high level of customization, this luxurious cruiser strives to be a mini-superyacht. 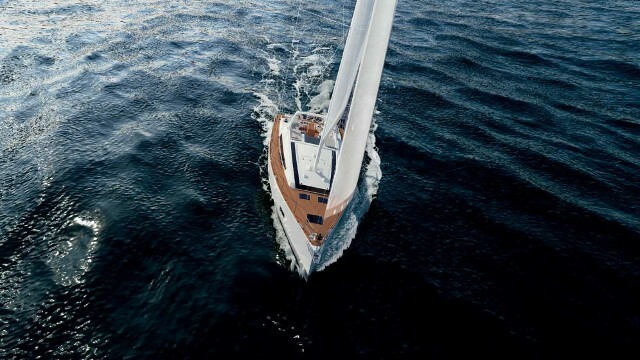 The Beneteau Oceanis carries 1,431 square feet of sail area, on a deck-stepped mast. 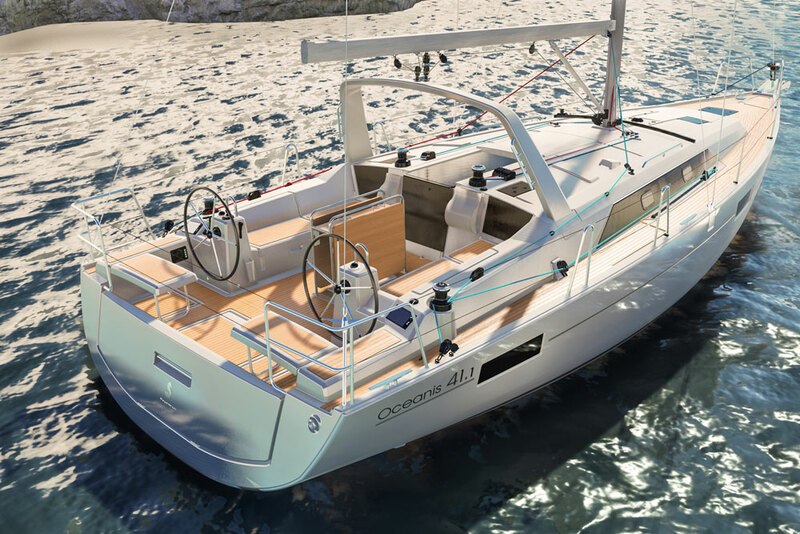 The noticeable feature on all the new Oceanis models is the hard chine of the hull. These new boats carry their beam well aft which provides more volume in the interior, but also creates a broad bottom that sails flatter than traditional designs. Under sail, the boat heels to her hard chine, finds her groove, and accelerates. The cast iron keel is available in deep (7’ 3”), shoal (5’ 11”), or very shoal (4’ 11”) draft versions. Like the rest of the new Oceanis line, the 55 features the push-button transom that drops down to form a teak beach and easily transports foot traffic from the water to the cockpit, past the dual helms, forward to where two sunpads abut the companionway. These lounges are well positioned so anyone using them can carry on a conversation with those in the cockpit, and unlike traditional sunpads on the bow, their occupants won’t be swept off the deck during a tack. Simrad multi-function displays are at each of the helms and the drop-leaf table in the center of the seating area holds an optional refrigerator. At nearly 80 feet high, the fractional rig looks imposing but is actually fairly manageable even shorthanded. 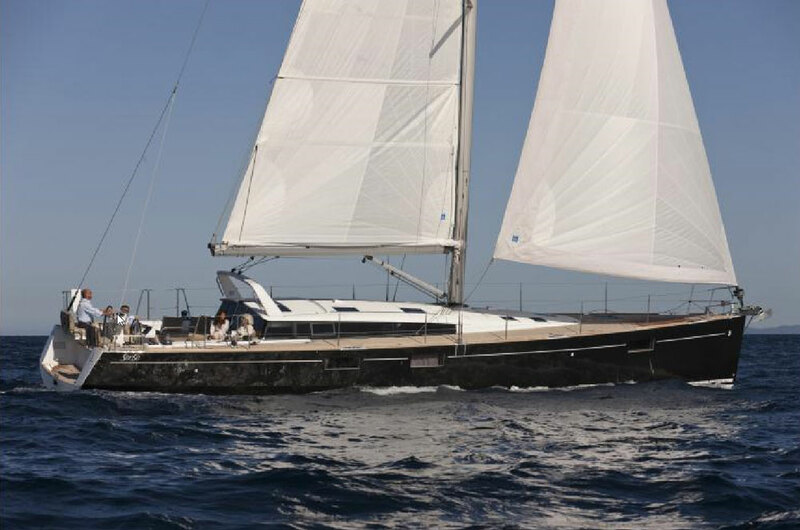 With a 105% genoa, the total sail area is 1,431 square feet on a deck-stepped mast that has been moved significantly aft. A furling main is optional. 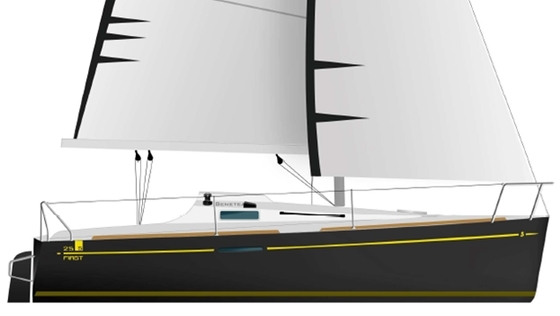 Like its sisters such as the Oceanis 48 (see Beneteau Oceanis 48: Slick Sailing with a Trick Transom), the 55 has a large arch over the cockpit which serves as the attachment point for the dodger and the mainsheet for which there is no traveller. Most of the fine-tuning of the mainsail is done with the mainsheet. There are relatively few level changes or toe-stubbers along the wide decks, which are low and keep the boat looking sleek. An opening anchor locker is just forward of the optional inner forestay attachment. For anyone venturing offshore, this would be a good option to keep the sail plan versatile and manageable with a staysail and a code 0 on the outermost forestay. With numerous cabin lay-outs to choose from, the Oceanis 55 gives you an unusual level of semi-customization. The customization of the Oceanis 55 interior is ground-breaking. The choices begin with a layout of up to five cabins (if you count the optional one in the forepeak, where some may stow the professional crew), and two or three heads. That means this boat will do equally well for large charter groups and for the cruising couple with occasional visiting family and friends. In most of the options, the master is forward with a centreline queen and its own head and separate shower, which are split and placed on either side of the cabin. When configured in this way, the stateroom is opulent but the bow area can also be made into two cabins, each with a separate head. Six companionway steps, set at a nicely manageable angle, lead from the cockpit to the saloon with a U-shaped dinette to starboard and a straight settee to port. In the standard version, the aft end of the extended seat forms a lounge. But half that lounge swings around to form a tighter U-shaped settee around the table, which unfolds to easily seat six for dinner. This leaves a seat open for the aft-facing nav station. The outboard cushion also swings to make the backrest of that nav seat while another cushion raises to complete the “U.” I had to watch the broker change it twice in order to comprehend how it works, and it’s truly ingenious. The galley is roomy and features a full complement of kitchen appliances; its size depends somewhat on the cabin arrangement opted for. In the standard layout, the galley is to port and is also U-shaped, with twin sinks and a two-burner propane stove/oven combination. 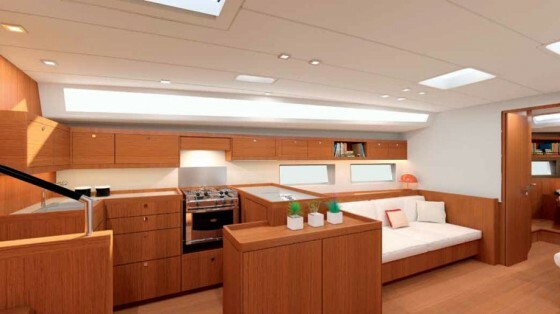 In the three-head layout, the galley loses some of its space as does one of the two aft cabins and the port settee. An optional over/under bunk bed cabin is on the starboard side and replaces a nice, large head with a separate stall shower. The headliner and the forward saloon bulkhead are white which is bright, and offsets the rich Alpi wood. The effect is European chic with clean lines but without being too angular or futuristic. Eight fixed hull ports bring in lots of natural light and provide a view. There is an abundance of standard features including eight winches, the electrically-controlled opening transom, Alpi mahogany interior trim and parquet flooring, and hatches with blinds and screens. 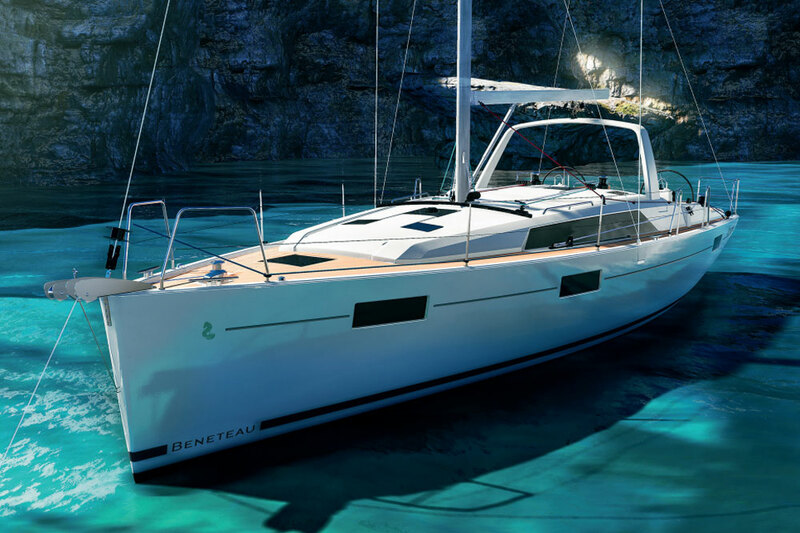 Two Beneteau packages named Advantage and Elegance start to compile the options for you, such as gel batteries, a deck wash down, electric winches, and Simrad electronics including autopilot and radar. The Elegance package also includes Benetueau’s Dock & Go pod-like system which integrates the 75 hp Yanmar diesel with a swivel Saildrive base, bow thruster, autopilot and joystick control. Beyond that package, extra goodies are available and include a water maker, electric heads, various TV/DVD locations, white composite wheels, and teak decks. For anyone considering distant shores, a necessary option is the extra tankage for both water and diesel. Sail Area 1,431 sq. ft. I like this boat, in fact, I like the whole new Oceanis line. It’s tough to pinpoint the differentiation between Beneteau’s Sense and Oceanis lines other than the positioning of the latter as distance cruisers with a good turn of speed. The Sense, called “monomarans” by some due to their generous cockpits, including the Sense 55, Sense 50, Sense 46, and also the Sense 43, are more built for comfort at anchor or at the dock. The Oceanis 55 is well suited to the task of acting as the flagship of the new series and is likely to find success due to its high style and substantial versatility. It can be just about anything an owner desires in a family boat that is reaching for superyacht status. 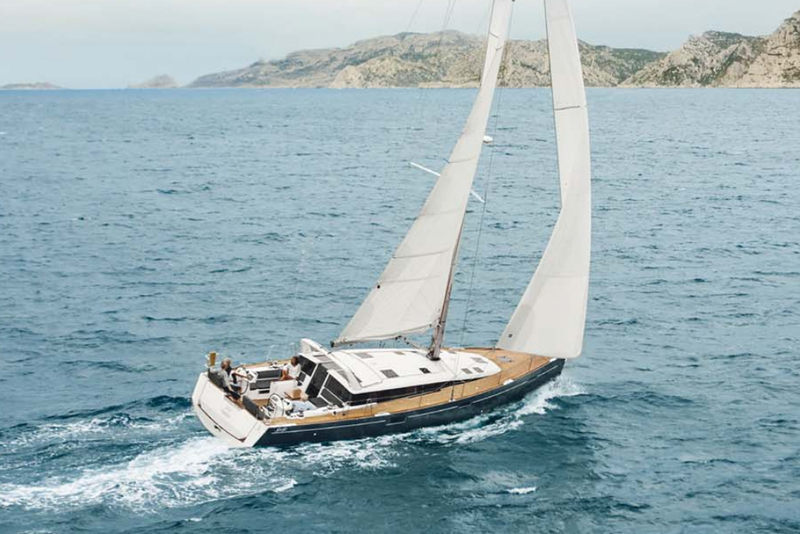 Other choices: The Jeanneau 53 is another sailboat in this class which is both versatile and attractive. The Fontaine Pajot Sanya 57 also reaches for yacht-like status, though this one is on catamaran hulls. 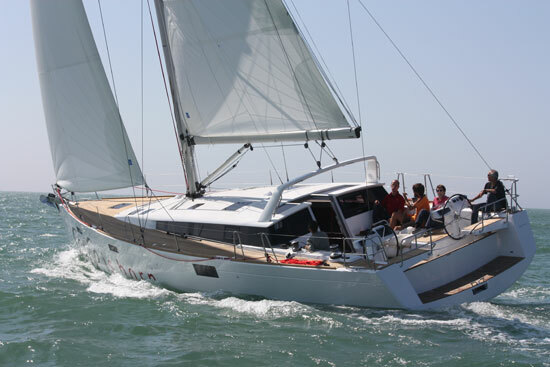 For more information, see our Beneteau Oceanis 55 Short Video Tour, or visit Beneteau.